JANICE Y.K. 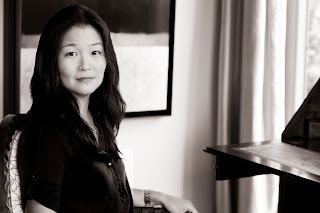 LEE is the author of The Piano Teacher (Viking/Harper Press, February 2009), a gorgeous feast of a love story set amidst the turmoil of Japanese-occupied Hong Kong during World War II. A 36-year-old mother of four, she was born in Hong Kong to Korean parents and lived there until she turned fifteen. She then left for boarding school in New Hampshire. From there, she moved to Cambridge, Massachusetts, where she spent four years at Harvard. After graduating with a degree in English and American Literature and Language, she moved to New York where she worked as an assistant to the beauty editor at Elle magazine. After a few months learning about the fashion business, she moved to the literary section of the magazine. Lee then moved to Mirabella magazine where she did more of the same. As much as she enjoyed her work, she came to realise that if she stayed on doing what she had been doing, she would not have the time to write her novel. Taking a deep breath, she took the plunge to quit. She wrote freelance for some time, and eventually embarked on the Hunter College MFA Program, where she spent most of her time writing stories, some of which were published in various literary journals such as Image and The Atlantic online. She was about to graduate with no definite plans in mind when she received a letter from Yaddo, the artists’ colony, notifying her that her application for a summer residency there had been accepted. She also found out she was pregnant with her first child. At Yaddo, she started to work on what would become her first novel. After she had her first child, she put away the manuscript for a year, adapting to motherhood. Then she had another child and picked it up again. She then moved back to Hong Kong. When she found out she was pregnant again with her third and fourth children, she had all the reasons she needed to complete the manuscript, seeing that she might not have the time to do anything ever again. Five years after starting on her manuscript, she had a good first draft and it was sold two months before the birth of her twins. Could you tell me a bit about yourself? In the years immediately preceding the publication of The Piano Teacher, I would say that I regarded myself primarily as a wife and mother. I spent much of my day ferrying kids back and forth to lessons and meals and spent much of my time with other women who were doing practically the same things. Still, I did steal time away to do this thing that I was both sheepish and proud of. How foolish it seems to say you’re writing a novel! When you are not getting paid and not going to an office, the idea of “work” seems fanciful indeed. I had always wanted to be a writer and I had spent my twenties writing short stories and freelance magazine articles, and had achieved some modicum of success in those fields, but a longer work—and the validation that that seemed to offer—had eluded me. When I became a mother, that became the focus of my life. And now that I have published my first novel, the notion of writing as my work is pushing to the fore. What was it like growing up Korean in Hong Kong in the 1970s? Not knowing anything different, I would say it was great. We had a small, tight community and there was a real sense of solidarity. As the children got older, we grew into identities that were more shaped by our peers—in my sense the American students at the American school I attended. When I got to the U.S. for school, many people thought I was from California. When did you first decide you wanted to be a writer? Was it something you had always set your heart on? I was an avid reader from first grade and have always wanted to write. (I distinctly remember reading Laura Ingalls Wilder’s Little House on the Prairie series of books then.) I could think of no better job or way to spend my time than reading and writing. Thankfully, that has not changed much and now I am able to do it as a job! Who are some of your literary influences? What kinds of books did you read when you were growing up? I read everything and everyone but now, I really find myself reading contemporary fiction. I feel it is so informed by what has gone before, and while it’s important to refresh yourself in the classics, I do think it’s important to support writers who are working now. So recently I’ve read books by Amy Bloom, Junot Díaz, Mohsin Hamid, Sue Miller and Jayne Anne Phillips, to name just a few. I don’t know that I can speak of any influences in my writing—the whole process is too unconscious for me to say such a thing. I am reading the following at the moment: Amy Bloom’s Away, Junot Díaz’s The Brief Wondrous Life of Oscar Wao, Mohsin Hamid’s The Reluctant Fundamentalist, Sue Miller’s The Senator’s Wife and Jayne Anne Phillips’s Lark and Termite. I read contemporary fiction, mostly. Was it difficult getting your first novel published? Did you experience difficulty in finding a publisher? I was very lucky in that when I finished the novel, there was a lot of interest in it and it sold very quickly. I had an agent from graduate school days, who took me out to lunch once a year and encouraged me to finish it. Previously, I had written short stories and found it very hard to get those placed. I love short stories, but the short story is a difficult form to succeed in, mostly because it is such a small market (unhappily, as they are real gems). Your novel reminds me of J.G. Ballard’s Empire of the Sun, Graham Greene’s The Quiet American, J.G. Farrell’s The Singapore Grip and Noel Barber’s Tanamera in tone and atmosphere. Have you read any of these novels? If so, what do you think of them? Among the novels you suggested, I’ve only read The Quiet American and I’ve seen the movie of Empire of the Sun so I cannot speak knowledgeably of their similarities with The Piano Teacher. Certainly, they all evoke a certain mood and time but other than that, I cannot really speak of their other similarities. What are some of the themes you deal with in your first novel? Were you conscious of these when you first set out to write the story? Writing is so unconscious (unconscious, not easy, which is an important distinction) a process to me that I never know what themes will crop up until I’m finished. It’s the same way with short stories so with something much bigger, like a novel, these ideas really didn’t surface until I read it when almost finished. I also didn’t think about a book in an intellectual, critical way, much the way you don’t think about your child in an objective, impassive way. That said, now that time has passed, and also other people have commented, I think there are themes of love and betrayal, survival and the choices you make when desperate, and how you repent at leisure. Also, colonialism is commented on in a very oblique way. Your portrait of Hong Kong in the 1940s and ’50s is admirable. How did you go about recreating the feel of this period? I think it’s all in the details. I am really an extrapolator. Give me a few details and I’ll infuse them into a world. In my mind, I saw the teak floors, the slow ceiling fan, the potted palms, the potted duck, and the English ladies with their afternoon teas and cocktail parties. I also read memoirs and watched movies. Then I tried to get it all down onto the page. How was the editing process like for The Piano Teacher? It was accelerated! The Piano Teacher was bought when I was around five months pregnant with twins, and my agent and I requested strongly that the editing process be expedited as it would be difficult for me to do anything after the twins were born. So they got me an editorial letter a month after, and I had around six weeks that I gave myself to do the work. Since I was on bedrest at the time, I spent many an hour in bed lying on my left side, with my laptop tilted on a pillow. I finished it on a Thursday, emailed it in, and then gave birth the following Monday!